As we proceed into 2018, I think it’s important to briefly take a look in the rearview mirror at 2017. The global ETF industry is over US$4.5 trillion in assets (source: ETFGI as at November 30, 2017), compared with US$3.3 trillion at the end of 2016 — therefore, the global ETF industry grew by more than a trillion dollars last year. As a comparison, in 2016, ETF assets grew by approx. US$522 billion, meaning global ETF growth last year was almost twice the amount of the previous year. 2017 inflows hit record highs in many countries around the world and Canada was no exception – ETFs in Canada finished the year with C$26 billion inflows, a 56% increase over the previous annual record set in 2016. 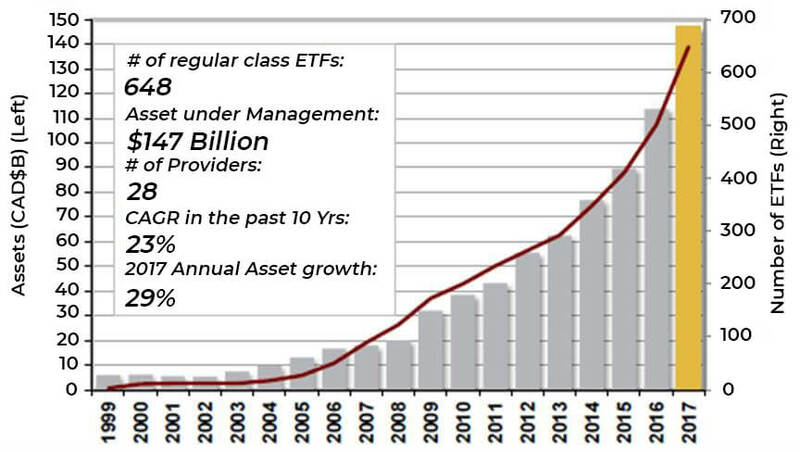 ETF assets exceeded C$147 billion, which averages over 20% growth per annum for the last 10 years. Yet still, are only 1/10th the size of our mutual fund industry and only 3% of the U.S. ETF industry. Thematic index-based ETFs tied to long-term investment trends which surround topics many of us talk about with family and friends, such as the latest hack, the growth of electric vehicle, or empowering women in the workplace. Given my 20+ years of financial services experience, I have been fortunate to make many friends in the industry and work alongside some incredible people. Some of those people have joined me at Evolve – and I can honestly say it`s been so satisfying to build a company with a team of smart, dedicated, and hardworking professionals. However, even with innovative products, and a great team – it is still going to be challenging. Much like the mutual fund industry of the 1990s if you have good quality products and execute a strong business plan you can succeed. I think 2018 will be another solid year for the ETF industry. As more investment advisors transition towards fee-based/discretionary practices, this increase will lead to greater inflows to ETFs. It’s rare for an investment advisor to tell me they are adding more mutual funds to their practice – but much more common for them to say they’re adding ETFs to their practice. By my account, roughly 20% of investment advisors are actively using ETFs. My view is this amount will double over the next few years. Actively-managed ETFs will continue to thrive. While actively-managed ETFs only make up about 15-20% of the market, I feel more advisors will allocate – especially in areas where active management can truly make a difference. Some of these areas include emerging markets, small to mid-cap equities, preferred shares, and high yield. Active management also provides investors with the opportunity to outperform their benchmark – which they`re guaranteed to underperform with a passive strategy. Smart beta growth will stall. How many more ways can we slice and dice a dividend portfolio? Some of these strategies have become so complicated that they’re impossible to explain to clients. The big three Canadian ETF issuers (iShares, BMO, Vanguard) will continue to garner 80% of the asset flow. But as the 20% grows in dollar terms there will be more opportunities for the rest of us. Thematics will increasingly resonate. Investors and their advisors will appreciate their investment value and its potential to be an alpha generator in portfolios. Environmental, Social and Governance (ESG) mandates will catch on. It’s starting to in the US. Over $800 million in ESG ETFs there. Most millennials want their investments to have a positive social impact. As we begin the largest wealth transfer in history, this segment of the investment population will not just gravitate to ESG portfolios but also in the form of an ETF. You’ll notice my predictions do not surround market performance. I don’t have a crystal ball – so I’ll leave that to the portfolio managers. Cryptocurrency, marijuana, and lithium were themes that dominated the media in 2017, and have been topics of conversation at every year-end holiday party last year. It will be interesting to see how these conversations – and what other themes will emerge in 2018.